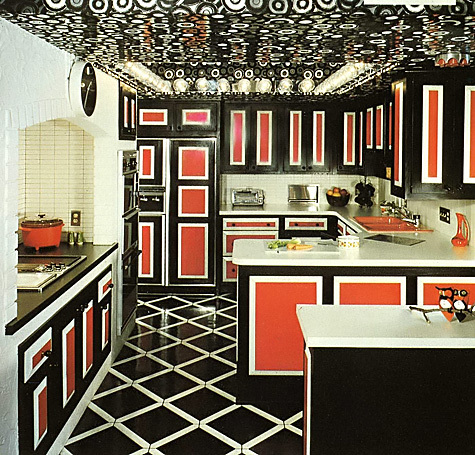 Welcome to this Saturday's special vintage kitchen, aka, "Bauhaus meets Disco"! I don't know why, (hmmm) but this one just popped out at me, as I perused my collection of vintage kitchens from the 60s and 70s. I think this kitchen was ahead of its time (for the early 60s), or perhaps was at the cusp of the disco era? You KNOW we need a disco ball light n the center of the ceiling! Get out your platform shoes and start dancing! Not a badly planned kitchen, really, although I'd love to understand what's going on with that second island up front, where and how that is positioned in the room. Otherwise, the wall cabinets to the right of the refrigerator should have been equal size sets of doors. I'm not sure I could concentrate on reading a recipe in this kitchen, and I'm also not sure I'd go stir crazy after 20 minutes! Other than that, enjoy!